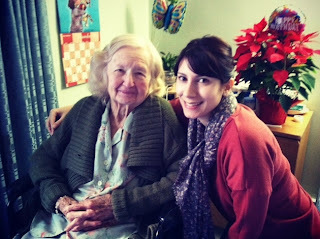 Yesterday was my Grandma Kay's 95th birthday! This is my dad's mom and the only true grandparent I've had in my life. We have bonded over old movies, Neil Diamond, crocheting, kitties and dessert! 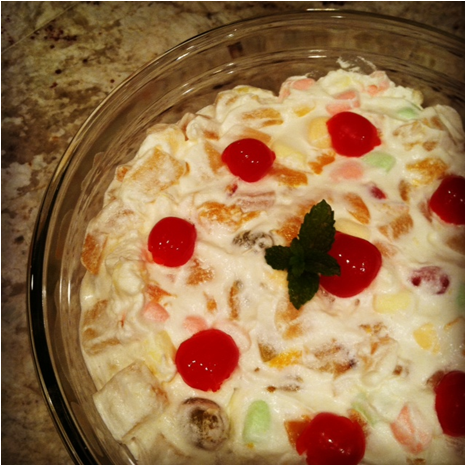 And a recipe that has stuck with me that she used to make time and time again is Ambrosia Fruit Salad. She often made this sweet side dish for the holidays and as an extremely picky kid, I usually had a small pile of corn, a roll and a ginormous scoop of this colorful fruit on my plate for Christmas. I've come a long ways since then, but I still had to have three helpings of this yesterday! Since she now lives in a convalescent hospital, she can no longer cook for herself and is often quite dissatisfied by the food they serve her.. so for her bday dessert, I made her Ambrosia Fruit Salad. She ate more of this than her lunch! Thoroughly drain the fruit cocktail and pineapple. There is pineapple in the fruit cocktail but that's not enough for me, so I add a can more! 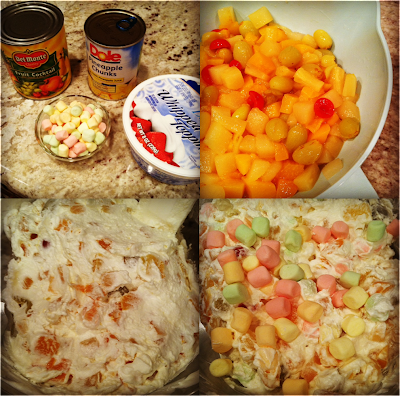 In a medium size bowl, toss in the fruit and fold in the cool whip and marshmallows. Make it pretty by topping it with maraschino cherries! 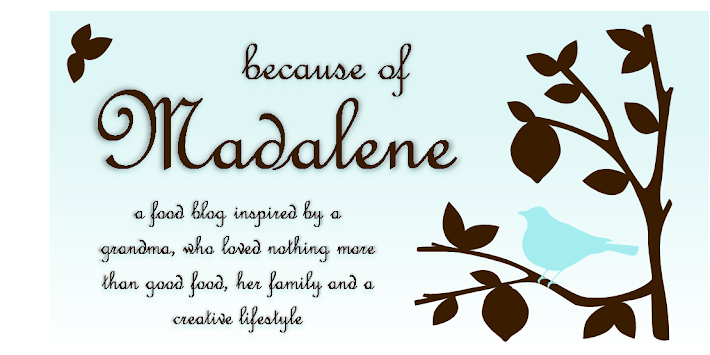 My mom used to make something similar! This post reminds me to make it for the xmas eve dinner I'm hosting soon. Thanks! I´m in love with fruit salads, and this one looks beyond delicious! I need to try this asap! My husband and I just made this tonight. He grew up on this, his step-father made it every fourth of July! And it is sitting in the fridge chilling! Thanks for the recipe! Funny how his family makes it for the 4th and mine is always for Christmas and Easter. :) But it's delicious anytime, right?! P.S. funny how your name is Christina marie so is mine! Only I spell it Cristina! 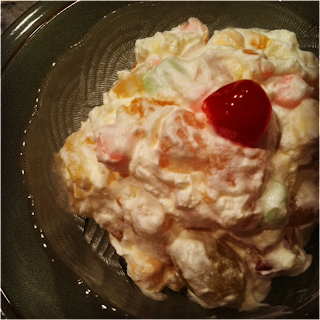 My mom has always made her ambrosia with fruit cocktail, shredded coconut, mini marshmallows & sour cream. 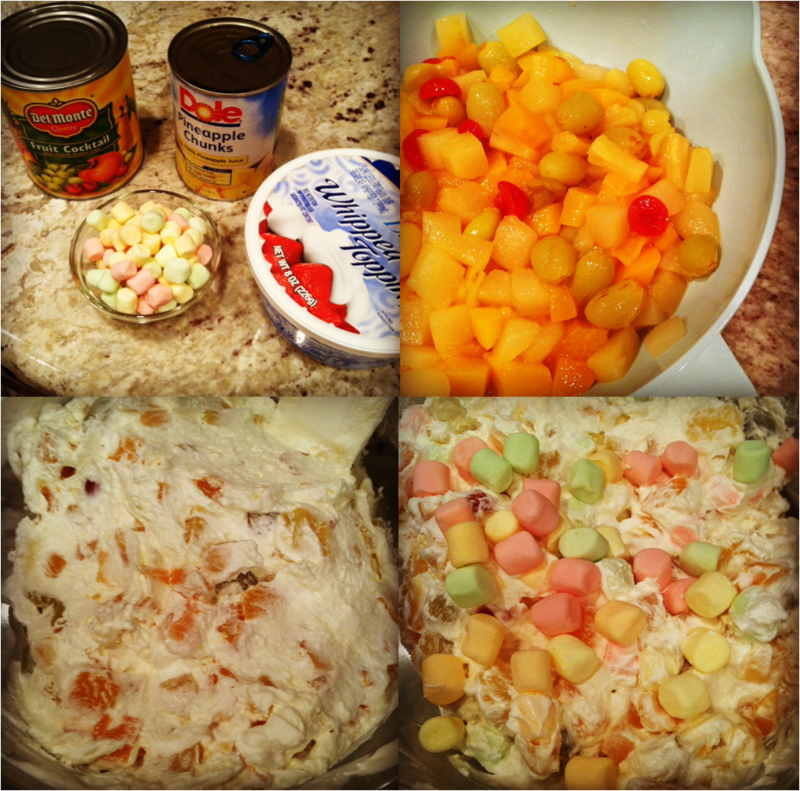 Few things also added are mandarin oranges, sliced banana, pineapple chunks cut in half. I prefer it made with the sour cream instead of non-dairy topping.